A study performed by researchers based at the University of Edinburgh and the University in Melbourne has found a common lung cancer drug can help women with ectopic pregnancies. An ectopic pregnancy is a life-threatening condition that occurs when a fertilized egg implants itself outside of the uterus. According to the American Society for Reproductive Medicine (ASRM), doctors report more than 100,000 ectopic pregnancies each year. The ASRM estimates the actual number of ectopic pregnancies to be much higher. Any pregnant woman can have an ectopic pregnancy. A fertilized egg cannot survive outside of the uterus; doctors must remove ectopic pregnancy tissue to prevent life-threatening complications to the mother. If detected early, doctors prescribe methotrexate to stop cell growth and dissolve existing cells. 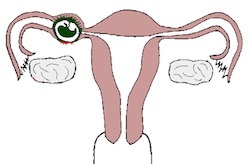 In some cases, surgery is required to remove fallopian tubes damaged by the ectopic pregnancy. Researchers in the study combined methotrexate with the lung cancer drug, gefitinib, which works by blocking a protein that encourages cell growth. Doctors have noted a strong presence of this protein in cases of ectopic pregnancy. Combining these two drugs can reduce the need for surgical removal of the fallopian tubes better than either drug alone. The scientists performed the research on 12 women with ectopic pregnancies. They plan to run a larger trial involving more women. One of the research leaders, Dr Andrew Horne, of the University of Edinburgh's Medical Research Council Centre for Reproductive Health, said: "An ectopic pregnancy can be extremely stressful for the woman involved. If we can reduce the need for surgery, and thereby help fertility levels, then that would be an enormous benefit. Reducing the treatment time for women who do not need surgery would also have a significant impact in reducing the emotional stress of such a diagnosis." Women concerned about the risk for ectopic pregnancy should consult a physician or reproduction specialist. University of Edinburgh. "Lung cancer drug could aid plight of ectopic pregnancy patients." ScienceDaily, 9 Sep. 2013. Web. 29 Sep. 2013. "Medical treatment of ectopic pregnancy: a committee opinion." Fertility and Sterility. American Society for Reproductive Medicine. September 2013. Web. 29 Sept 2013.